The sound of the Sugar Kings is a mixture of Dixieland and ragtime and early blues with an homage to pre-war harmonica players thrown in for good measure on Take Your Time, Mr. Brown. If you’re a pre-war harp fan, this CD is for you. Clint Hoover covers a Blues Birdhead song, two tunes by Jazz Gillum, and his own composition, Darling’s Dream, named after rag harmonica player Chuck Darling. If you are unfamiliar with Clint Hoover’s harp work, expect the unexpected. Not only does he go back before World War II for his sources, his playing is informed by the same pioneers of the modern harp playing. Clint has a playing style that virtually transcends the instrument, as we said before about Clint’s playing on his last CD. His playing offers a breath of fresh air that avoids the cliches of harp playing with its focus on the prewar sound. The group itself of harp, guitar, and tuba might seem an unlikely combination but the interplay of the musicians forms a tight ensemble. While the focus here is on the remarkable harmonica playing of Clint Hoover, the stellar efforts on guitar by Cam Waters and Steve Sandberg’s tuba and trombone playing cannot be ignored and are an integral part of the overall sound. As far as Hoover is concerned, he plays with a consistent greatness and continues to astound. Probably the best test of a CD is that even after countless listenings the songs sound fresh and interesting, never predictable or plodding. Part of that is due to Clint’s eschewing what has come to be traditional blues riffs and fills represented by the later Chicago electric blues icons. But make no mistake, just because most of these tunes are pre-war, doesn’t diminish their power. For openers, there is Papa’s on the House Top from Leroy Carr. the Ice Cream Man by Tom Waits, the traditional hokum blues song Furniture Man, and from Jazz Gillum, Gillum’s Windy Blues and Crazy About You. Booker White’s Fixin’ to Die, Fats Waller’s Sad Sap Sucker, and Blind Lemon Jefferson’s Bad Luck Blues. Charlie Poole’s Leavin’ Home and even Blues Birdhead’s Get Up Off that Jazzophone, Darling’s Dream (Hoover’s homage to Chuck Darling), The Louis Jordan tune, Is You Is Or Is You Ain’t (Ma’ Baby), The Memphis Jug Band’s On The Road Again, and Gene Autry’s Bear Cat Mama and even Don Gibson’s Oh Lonesome Me. Clint sings lead on three of the Sugar Kings CD tunes: Windy City Blues, Get Up Off That Jazzophone and Crazy about You. Cam Waters sings lead on the rest and Clint does the harmony/background. The Sugar Kings play unique, lively arrangements of vintage acoustic blues, garage jazz, and original American music. Formed in late 1997, and winner of the 1998 Minneapolis Jug Band Contest, they released their first CD, Take Your Time, Mr. Brown, in early 2000. The Sugar Kings, a trio composed of guitarist Waters, harmonica player Hoover, and tubist/trombonist Sandberg, play and sing on a combination of blues and folk that has a mountain music taste tinted with the flavors of rag, skiffle, and the New Orleans style. They are joined by guests Hull, Hinkley, and Fields playing a variety of rustic instruments including washboard and fiddle on selected cuts. The unusual instrumentation blends with the vocalizing to portray the rural roots of America. Waters and Hoover are the chief singers who spiel out the down-home verses while Sandberg sets the bass line down with his huffing tuba. Hoover takes center stage on either the diatonic or chromatic harmonica, adding the spirit of an agrarian land to the 15 diverse tunes on the disc. Waters sets the rhythmic pace on the guitar and also diversifies on the cymbals and other paraphernalia. Singing, however, is their prime focus, and harmonizing an intricate part of the music. The Sugar Kings capture the early American pioneering spirit in their music and present it with basic simplicity and authenticity. Country is in their blood. This local trio conjures vintage blues and jazz that beg to be played in a steamy Delta bar amid potted palms, white tiles and slowly rotating ceiling fans. Cam Waters leads the way on a variety of acoustic and steel guitars, adding understated but marvelously expressive vocals. Clint Hoover, late of the Blenders, chimes in with masterful diatonic and chromatic harmonica work, and Wolverines/Imp Ork vet Steve Sandberg anchors it all with his tuba and trombone. The Kings’ debut album, Take Your Time, Mr. Brown, is loaded with sweet treats by the likes of Jazz Gillum, Bukka White, Leroy Carr and even Tom Waits. Since beginning his career as a professional musician in a local duo with Rick Tyler some 20 years ago, Cam Waters has steadily advanced his art and his craft to rank among the finer singer/songwriters extant. A nimble guitarist with a resonant, woody vocal instrument, Waters went on to a brief stint with the Heptiles before going solo and taking his folksy act across the country. Minnesota, (first, Red Wing and, more recently, the Twin Cities) has been his home base for some time now, and the three sturdy, introspective solo albums – Bessie’s Gone (1988), Big Moon (1993), and Shoetown (1996) – he’s launched from there indicate that the north country suits him very well, indeed. Waters has long displayed a deep-rooted interest in vintage American blues and jazz forms, and for this delightful romp with The Sugar Kings, he’s kept his own songwriting in his pocket to polish some worthy chestnuts from the past. A full dozen of the disc’s 15 tracks hearken from the period between 1926-1944 (written by the likes of Jazz Gillum, Blind Lemon Jefferson, Fats Waller, Leroy Carr, Louis Jordan and Gene Autry), with the remaining three cuts by Tom Waits, Don Gibson, and The Sugar Kings’ sterling harmonica wizard, Clint Hoover. Produced by Waters and Dakota Dave Hull with a warm, full-bodied sound, Take Your Time, Mr. Brown ties these vintage tunes together into a cohesive, easy-going piece that goes down like fine sippin’ whiskey. Anchoring Waters’ dandy guitar picking and Hoover’s wide ranging harmonicas are the good-timey “air bass” acrobatics of Steve Sandberg’s tuba. And, despite the antique vintage of the bulk of the selections, the vocal deliveries of Waters and Hoover manage to at once respect the sources while keeping the presentation engaged and alive. This is a real winner and highly recommended. Here comes the Sugar Kings — winners of the ceremonial waffle iron at the Minneapolis “Battle of the Jug Bands” in 1998 — with their debut CD: a charming roots affair with the rather odd instrumentation of guitar, harmonica and tuba. All three members play music from old 78s — acoustic blues, “garage jazz,” country and hokum — as if it was their birthright, but this is the kind of record where Tom Waits fits perfectly alongside Gene Autry, and the unregenerate hard country blues of Bukka White is as welcome as the proto-R&B strains of Louis Jordan. Guitarist Cam Waters is a confident and colorful enough singer to bridge all those backroads of Americana. Clint Hoover quietly amazes with an assortment of harps. And Steve Sandberg’s tuba bass lines give the little band its special jolly bounce and character. Having guests as savvy as Dakota Dave Hull (national steel guitar), Bill Hinkley (fiddle), and Jim Fields (percussion) doesn’t hurt, either. The Sugar Kings perform next Sunday at Cedar Cultural Centre in Minneapolis. There’s a mythical place in the land of Americana where blues, country and trad jazz meet. It’s not too far from New Orleans. That’s where the Sugar Kings come from. And the three of them – Clint Hoover on diatonic and chromatic harmonica, Steve sandberg on trombone and tuba and Cam Waters on guitars and vocals – sure paint a beautiful picture of that home land of theirs in Take Your Time, Mr. Brown. This record includes mainly covers of pre-war blues artists like Jazz gillum, Bukka White and Blind Lemon Jefferson, although the arrangements, as hinted above, are nothing sort of genial. They bring us back to a time when the sharp divides between blues and jazz, blues and country did not exist than they are nowadays. 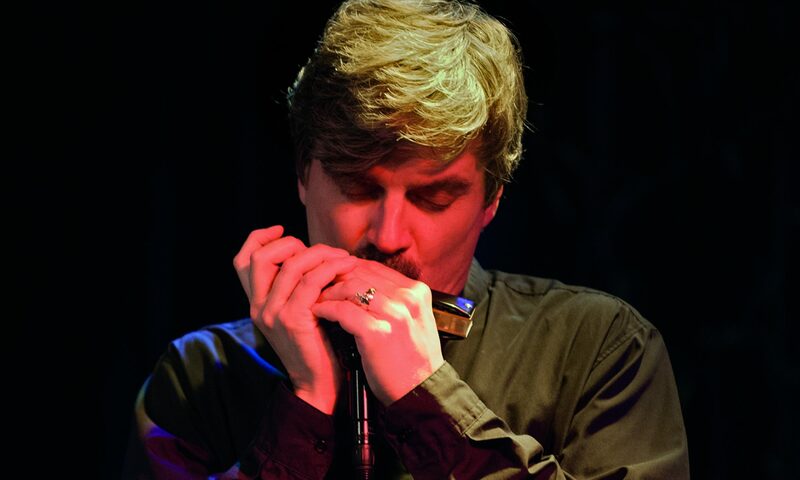 Clint Hoover had made a strong impression on the harmonica community (and indeed hopefully on a wider audience as well) with his jazz album Dream of the Serpent Dog released in 98. That opus featured Hoover mainly on Chromatic, so it is a delight to discover here that not only is he just as fluent on diatonic, but that he probably is one of the very best and inventive players of blues around today. His rythmic backing is impeccable, his soloing is joyful and harmonious. And, by the way, for those who still wonder if overblowing and blues don’t go well together, try listening to this guy! At the end of the day, Take Your Time, Mr. Brown is a lot more than clever musicianship though. There is an evident joy of playing good music on that record that is really refreshing. It manages to be both respectful of the musical traditions that inspire it and at the same time revisit these standards with arrangements that sound different and new. If you like any or all of the styles mentioned above in introduction, it would be very surprising if you didn’t like this record. If you’re particularly into pre-war blues, you will surely love what the Sugar Kings have done! It has been a long time since I came across a band that performs songs by such a varied array of blues and jazz artists. The Sugar Kings, out of Minneapolis, have taken songs by Bukka White, Leroy Carr, Louis Jordan, Tom Waits, Fats Waller and Blind Lemon Jefferson and have put their own stamp on them. You could call these guys a jug band, but they are much more than this. The new CD Take Your Time Mr. Brown is a fine collection of smooth acoustic music that has that jazzy feel straight out of that good time sound from the 1930’s. The band is led by Cam Waters who plays guitars, sings lead vocals and keeps time on the hi-hat cymbal. His slide playing on Lemon Jefferson’s Bad Luck Blues is a thing of beauty. New life has been given to that old scratchy recording. Waters has performed with Dakota Dave Hull and he has appeared in concert with Doc Watson, Greg Brown and David Bromberg. Clint Hoover on harmonica is a music veteran who co-led the Blenders and decidedly adds an element of swing to this band. His playing on Gillum’s Windy Blues is spirited, to put it mildly. His work on the chromatic harp on Tom Wait’s Ice Cream Man gives the tune a smooth moody sound that fits the song exactly. His own composition Darling’s Dream is a sweet swinging number that may be the high point of this recording. On tuba and trombone is Steve Sandberg, who has performed locally with the Wolverines and Inside Straight and nationally with The Four Tops and Jr Walker and the All-Stars. His support and rhythm playing give the band that Memphis jug band sound. When all three are cooking, it is hard to sit still and just listen. You know, these tunes were written with some dancing in mind. The Sugar Kings get some help in the studio from Bill Hinkley, Jim Fields and Dakota Dave Hull. The CD is a satisfying collection of varied songs from many different sources. I found the recording to be refreshing and a repast from the hard guitar led bands that dominate the night club scene. The Sugar Kings are a new generation of players in the tradition of Spider John Koerner, Dave Ray and Tony Glover, yet with a spirit and sophistication that is uniquely theirs. Listening to this collection, I concluded, that the Sugar Kings are cooler than a gin rickey sipped on a New Orleans French Quarter balcony on a warm spring evening. “Take Your Time, Mr. Brown” features the Sugar Kings with Clint Hoover on harmonica. This one is deﬁnitely up there on the Clint Hoover charts. It’s a Whimsical romp thru the Blues, Jazz and other American musical styles, which are some of my favorite styles to listen to when I’m in a good mood. Clint’s playing is as tasteful and clever as it ever has been and he ﬂows between diatonic and chromatic with ease. Clint has shown an amazing range over all these CD’s I’ve been listening to and I can’t wait to hear more. So far, The Sugar Kings is one of my personal favorites of Clint’s many musical personas. Between 1997 and 2002, the Sugar Kings were a popular group that performed their unique brand of traditional and original Americana music throughout the upper midwest. A decidedly left of center trio, they were dedicated to taking American roots musical forms out of the archives and infusing them with the spark and vitality they deserve. This attitude is evident on their only release, Take Your Time, Mr. Brown. Released in early 2000, it became an instant hit on acoustic radio programs throughout the midwest, as well as a critic’s favorite. Using a big, greasy serving of blues and jug-band music as a starting point, then adding for additional flavor everything from pre-World War II Jazz and Western Swing to Tom Waits to their own off-kilter imaginations, The Sugar Kings wound up with one of the freshest releases of acoustic music to be heard in far too long. The CD features Cam Waters on vocals, guitar and hi-hat cymbal whacking, Clint Hoover on diatonic and chromatic harp and vocals; and the tuba and trombone of Steve Sandberg. This CD will be of special interest to fans of pre-war harmonica. Having studied the styles of early pioneer harpists such as Jazz Gillum and Blues Birdhead, Clint Hoover goes about reinvigorating this tradition with his own unique approach.